All countries have one primary culture. This is normally fixed, although it can be changed either through the culture mechanics or via certain national decisions. Any accepted culture that has at least 50% of the development of the country’s state cores can be promoted to the primary culture of the nation. This costs 100 diplomatic power, and replaces the previous ‘Accept Cultural Shift’ decision. The previous primary culture will consequently become an accepted culture. The player can not shift to a culture that is accepted due to the cultural union granted by Empire level government. It can be advantageous for a player to set a new primary culture to be able to form a country with a different tag (with new national ideas), or to be in a larger culture group, to have more brother cultures and save promoted cultures slots. If the nation has very few states active, it can state and de-state provinces to frequently change the primary culture to obtain Nationalism casus belli on more countries, as well as to reduce the time of coring. The player has the ability to promote a culture to make it accepted or to demote it, removing it from accepted cultures. The player can promote any culture in his nation that has at least 20 cored development in a state. It costs 100 diplomatic power, but it could be advantageous in the long run. Demoting a culture from 'accepted cultures' costs 10 diplomatic and adds +5 unrest in all provinces with that culture, that will decay over time. Having at least 5 different promoted cultures is an Age Objective in the Age of Absolutism. Cultural unions will automatically accept all sub-cultures within their respective culture group. Any nation can become a Cultural Union (CU) of its culture group upon reaching the Empire government rank, or 1000 development if the player does not have the Common Sense DLC. As part of this change, it is possible for several nations to be a CU for the same culture group. A nation can become an empire as part of a decision, event, reaching a certain development level or by upgrading the government rank; Cultural Unions make it so that brother cultures don't have to be promoted to be accepted by the country. Republics get an additional cultural sufferance modifier in different culture-group provinces. This stacks with the usual penalty, mitigating but not eliminating it. The culture of a province can be changed to another culture if the province is cored by its owner, has the same religion as its owner and has no Separatism unrest. The cost for converting culture is 10 diplomatic power per development and the duration for the change to take place is 10 months per development. Like coring costs, culture conversion costs are capped at 30 development, so improving a 30 development province will not increase the cost of converting its culture. Sieges and occupations will pause culture conversion but will not cancel it, the culture conversion will continue as soon as the province is liberated, although conversion will be cancelled if the province's ownership changes. If the conversion is cancelled before progress reaches 10%, all diplomatic points will be refunded. A province can have its culture changed to the primary culture of the province's owner. With The Cossacks, a province's culture can also be changed to any owned neighbouring province's culture or its culture can be restored to whatever it was originally. Converting a province from culture A to culture B will incur a relations hit with every country whose primary culture is culture A. The cultural conversion cost modifier reduces only the diplomatic power needed to change a province's culture. The time needed for the change to be complete cannot be reduced. −10% Pushing the Tatars Back Russian mission: “Drive Back the Tatars” for 15 years. Most cultures have a primary nation. These nation will keep uncontested cores indefinitely, so long as their cores are in provinces of their culture - culture conversion will force these cores to obey the normal 50/150 year expiry timers for cores depending on whether or not the new culture is the same culture group as the nation with a core there. Primary nations of each culture can be found in the list below. Cultures in the Lost Cultures group do not exist at game start, but can be created as custom nations or during the invasion. The only culture that can be re-discovered is the Roman culture by Restoring the Roman Empire that changes the primary culture of the nation. All provinces with the former nation's primary culture will change to Roman culture. Note that culture groups are not just based on linguistic criteria - for example, Romanian is grouped with the Carpathian cultures due to cultural similarities and for gameplay purposes, even though Carpathian is not a linguistic family. Primary nations of each culture are listed to the right of each culture. Owning all provinces of the player nation's culture group is an Age Objective in the Age of Reformation. 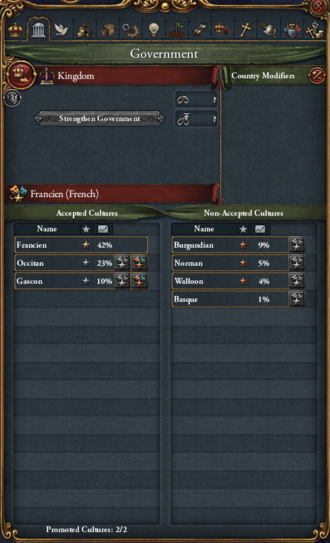 This ownership does not include colonial nations; if the player nation wants to fulfil this Age Objective while pursuing the Age Objective of having at least 5 colonial nations, the player has to change the culture of the provinces before the colonial nation is formed. ↑ The last version of the decision ‘Accept Cultural Shift’ for patch 1.17 can be found here. ↑ From /Europa Universalis IV/common/defines.lua: MONTHS_TO_CHANGE_CULTURE = 10, -- How many months it will take to change culture in a province, per development. ↑ Verify as Russia, "War of the Quadruple Alliance" bookmark: Full Religious, Enlightenment, Influence-Religious: Cultural Unity, Parliament issue "Assimilation and Settlement Policy". ↑ From /Europa Universalis IV/common/defines.lua: CULTURE_COST_DIFF_ADJACENT = -25, -- Difference in cost in percent to convert to adjacent culture. ↑ From /Europa Universalis IV/common/defines.lua: CULTURE_COST_DIFF_ORIGINAL = -50, -- Difference in cost in percent to convert to original culture. This page was last edited on 5 April 2019, at 16:56.